Come hell or high water. ...and it came: the high water and then soaring temperatures, but none of that was able to slow down the Calgary Stampede. A huge flood that demolished small towns and shut down the downtown core of Calgary's business sector also filled the grounds of the Calgary Stampede two weeks before the heralded 'Greatest Outdoor Show on Earth' was set to take place. 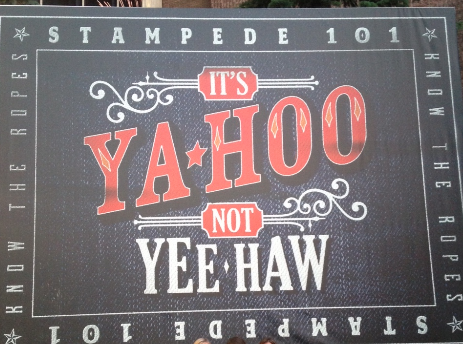 While thousands of people slept on couches, hotel room beds and cots in gymnasiums, the folks over at the Calgary Stampede got to work to make sure that nothing stopped their show from going on. Hundreds of man hours later the Stampede grounds opened on time. Not only that, but I would have never guessed, had it not been on my TV for a solid week, that just days before the whole place was under water. The Saddledome and the Virgin Mobile concert series didn't fare as well with all four of their big shows getting cancelled. Tim McGraw, The Dixie Chicks, Carly Rae Jepsen and KISS had all been scheduled to play the last four days of the event and were now free to have a night off and skip Calgary off their tours. The other events held in the Saddledome were also cancelled. So what of the parts of the Stampede that did go on as planned? The carnival games handed out dozens of ugly stuffed animals that you will find in garage sales all over the city come August. 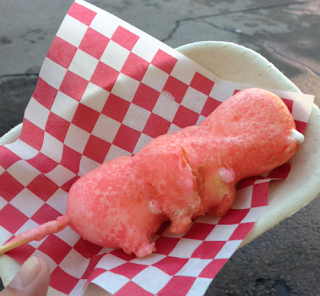 The mid-way food presented us with beloved mini doughnuts and new gross deep fried concoctions. Deep friend bubble gum anyone? Yeah, definitely pass. The beer tent attendees were met with the regular long lines and the pungent smell of vomit. The rodeo attendees cheered on their favorite cowboys and the Chuckwagon spectators watched at High River hometown boy Jason Glass won all the big prizes which bagged him over $140,000 in cash. Cha ching. How can I sum up the Grandstand Show in a couple of sentences? You just can't really. There are so many things about it that just make me want to punch someone in the face I don't know where to begin. 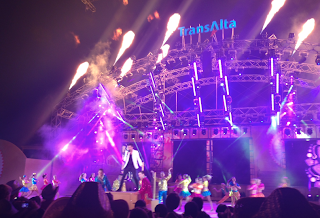 If you have seen the Grandstand show before you will know that it is a bedazzled smiley mess with no real continuity involved, but just enough 'Wow' factor to keep you entertained and surprisingly unannoyed. You have the standard acrobats from China (who are awesome and are probably ninjas in their spare time), the Young Canadians (who are slightly terrifying versions of a high school cheerleaders...on coke and uppers), musical acts flying in on hanging stages and pianos, the hoop dancers and really terrible covers of current top 40 hits. The most awkward and uncomfortable act of the show (there were so many, but this was a standout) was Calgary raised Raghav singing his hit single Fire. He is either an extremely dry performer or he was just completely unenthused to be performing on the Grandstand Show stage. Either way, he looked like he would like to be in any other place than on that stage. Terrible. The Grandstand Show also had a tribute to the flood and the city of Calgary...obviously. But other than that, and all my other complaints, the Stampede went off without a hitch and was great. Yee-haw.